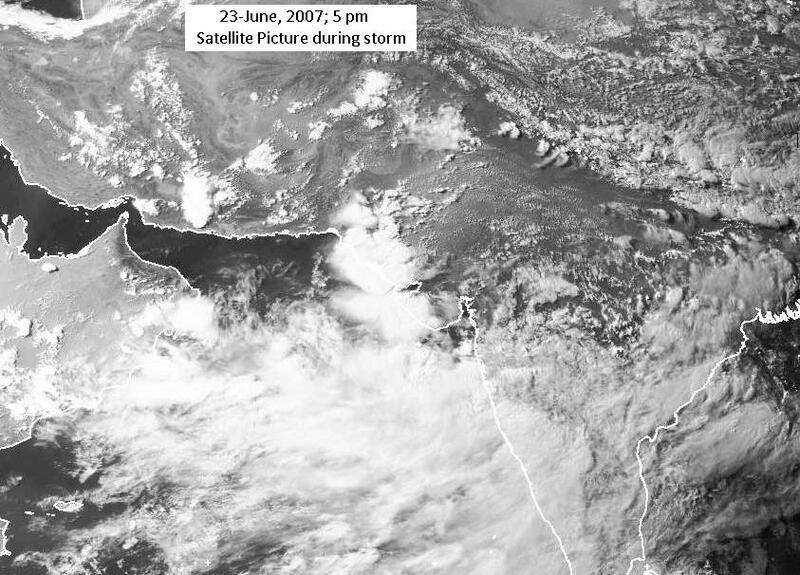 Due to intense tropical Low/Depression moving from Bay of Bengal into central-western India, Karachiites were already facing acute hot and dry weather on Thursday, 21st June 2007 when it was 39°C but in the evening it turned dark and a dust/thunder shower gave the city some relief around 8 pm. However it was even hotter on next day i.e. Friday, 22nd June and high temperature was 42°C. Saturday, 23rd June 2007, morning: We were not expecting anything special but another very hot day, with dry and warm breeze already blowing from NE. 11 am – 12 noon: Increasingly hot breeze coming from ENE and temperature was already touching 40°C. 1 – 2 pm: It turned even extremely hot, more than expectations, and it touched 44°C by 2 pm with strong dry, very hot winds from NE and few stray type clouds coming from ENE. 2 – 3 pm: At the same time some good cumulous & cirrus clouds appeared especially at SE side of city, moving in ‘traditional Monsoon way’ (from ENE) and kept building in that SE corner. 4 pm: Some dark and ‘promising’ patches of clouds moving ENE to WSW, mostly were in SE part of city, then few reports of drizzling reported even then very hot wind continues. 4:30 pm: In no time, almost whole eastern horizon of the city turned ‘grayish black’ as clouds quickly turned into a storm blanket or ‘ghata’. Bit surprisingly for me, even then there was not such stifling (hubs) condition and wind continued from NE. 4:40 pm onwards: Then those devastating period of 40-45 minutes that convert the City of Lights into Pictures of destruction. Initially the sky turned dusty yellowish, extremely strong winds up to 110 kmh started blowing with intense dust, later may be after 15 minutes, rain also accompanied with demolishing winds that continued till 5:20 or 5:25, then again surprisingly storm suddenly stopped and then just drizzle continued for a while. By the night it remained mostly cloudy with drizzle at times and almost no breeze. 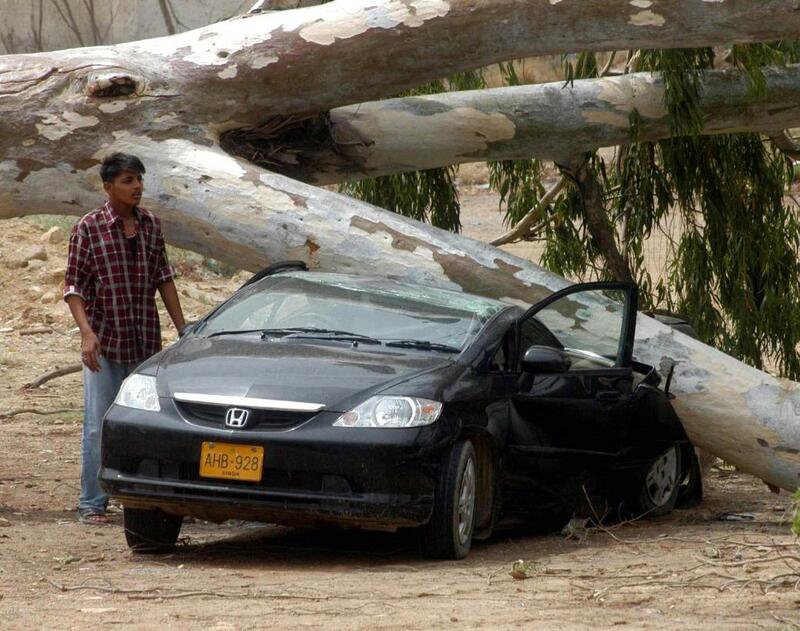 It caused over 220 lives in city and its outskirts, most of them caused by ‘flying objects’ like roofs, sign boards, walls collapse, and electrical poles, wires accidents. Honestly, even I and most of people in Karachi, as ‘Rain lovers’ would never want to see such day again here or anywhere but such events give us (people and as well governments/authorities) a lot of lessons to get prepare for any natural disaster, avoiding its losses as much as possible and most importantly to ask Allah for His forgiveness and blessings. Yes, the city has much better infrastructure now than few years back..